You can wear just about anything on the streets of NYC and never turn heads. It’s rare — if ever — that someone will stop and comment on your outfit. But Debra Rapoport gets stopped. Multiple times per day. Maybe it’s the giant aluminum paperclip hanging from her ear. Debra picked up that paperclip at a bookstore in Encinitas, California about five years ago. She could tell right away that it belonged on her ear. “Before I even walked out of the store and paid for it, I saw it as an earring. Things speak to me,” she told Senior Planet. It’s not just the paperclip that gets Debra noticed. A creative dresser almost from birth, she’s a fixture on Ari Seth Cohen’s popular Advanced Style blog, which showcases stylish older women. Last year she appeared in Cohen and Lina Pioplyte’s Advanced Style documentary, which features several of the blog’s now-famous ladies. We caught up with Debra in her apartment in Manhattan’s West Village to ask about her hats, the difference between style and fashion, and how the Advanced Style phenomenon has changed her life. It’s how I present myself to myself and the world each day. And its about being in a relationship to self. It’s definitely self-expression, because it’s style and not fashion. To me, style is personal and fashion is the industry and trends. I don’t follow fashion. This might be tough for you. But do you have a favorite outfit? No, I don’t have a favorite outfit. But I do always wear hats. So I make hats and I wear hats, because one of my mottos is “frame the face.” That can be done with a hat, with a boa, with a bib, with a breastplate, with a scarf, with a necklace. But I definitely think that wearing a hat sets you up and sets you up apart — especially because I like to make my own hats. I’ve been making hats since I was three — it might have been with a paper bag or a purse, but I have always put things on my head. I have philosophy that a lampshade, a vase and a hat are all interchangeable. So, I used to have a flower business and I used to love collecting vases. I also designed lampshades for a company, and I also made hats. Sometimes the same material I would use for a lampshade, I would make a hat out of, because they are all vessels. That’s how I see it. What do you think about the state of older women’s style now? It’s hard for me to say, because I don’t shop. But I think since Advanced Style, older women have stepped out and upped the ante a bit. This whole thing about appropriateness — how do you define that? Who’s to say what is appropriate? Do you have to follow rules? But I know people feel self-conscious if they are a little bit too over the top. You made that point in a TedX talk you gave with Ari Seth Cohen. You said, “With creativity there are no rules. Where there are no rules, there is no fear.” How do you see that playing out in your life, beyond style? I think that life is a creative path, and you can go down it any way you like — usually one step at a time. I am far from fearless, but if I allow the creativity to guide me, I know it’s from my truth. And if it’s from my truth, I have that sense of inner support. I mean, I am not anti-establishment, I’m not a maverick, but it’s about not trying to fit into what society says is success or having to live by the rules of society. It takes a long time to get there — it doesn’t come overnight. Being 18, 21 and 25 is not easy, and I would’t go back for anything. Life is just full of doubts, and I think that’s kind of a lesson. When stuff shows up, how do you surrender? Because stuff will show up. What advice would give your 30-year-old self? “Don’t worry. Let the river carry you. Don’t force the river.” That’s very hard when you are young, because you want, you need what your peers and society say. You know, I think our culture is so based on success, it could bring me to tears. There’s so much stress. I think it is worse now than ever before. So at a young age, to constantly go inside and to really stay true to yourself is the hardest, but also the most worthwhile. As Oscar Wilde said, “Be yourself. Everyone else is already taken.” And of course it’s not easy, so I always say to young people, find a peer group — even if it’s just one other person to be your ally, to be on the same page and be there for each other — and just leave everyone else behind if they are going to bully you. Is having a peer group still important? It’s the same as you’re aging. Ari and I went to Wisconsin to speak to 500 social workers on aging and disability. They’ve had so many cutbacks there, and so many people live on the prairie in isolation. If you don’t have a community, you are just going to shrivel up and die. That’s why I say, being in the city is the best. There’s one story I like to tell. There was just one small town that had a gas station and a coffee shop. The coffee shop closed, and the people were devastated. But someone had the idea to get a little round table, a couple of chairs and a coffee pot, and they put it in the gas station so at least people could gather, there was a center. We are social beings. We cannot be alone. Were you always a creative dresser? Yes, from a very young age. And fortunately I had a grandma and a mother who encouraged it. It was not considered frivolous. I always like to tell the story about my maternal Grandma, who my sister and I just loved. We would go to her house, and she had a sewing machine with a button drawer. We would dump all of the buttons out, and my grandfather would say, “You’re making a mess!” And my Grandma would say, “Be quiet, they are being creative.” And all these years later, that still resonates with me. My sister and I each had just one doll, and this was because we preferred to dress up ourselves and dance around the living room and change costumes — and this was encouraged. My mother would save her hats, her shoes. It wasn’t about shopping. It was about what can you do with nothing? What can you do to transform yourself? What can you do to transform things? You call the accessories that you make and sell “objects for the body.” If you could only bring one to a desert island, what would it be? I would probably take a hat — a hat that worked as protection as well as statement. Definitely a hat. And I could add palm fronds to it or seashells. Can you give us two top style tips for older women? Frame the face. And the other one would be feel good, look good. Look good, feel good. It’s up to you to look in the mirror and say, What is going to make me look good — no, what’s going to make me feel good? First, check in: How do I feel? Then, put on your body what’s going to support that. And then you are going to look good. So it goes back and forth. If you look good you feel good. If you feel good, you look good. I also say style is healing. So when you find your own style, then you are in a relationship with self and therefore in a place of wellbeing and healing. You feel complete. Again, it’s not about shopping. Some of the best shopping we can do is in our own closet. Ari, labeled me “gifted and thrifted,” because I always shop at thrift shops and people send me things all the time. I feel very lucky, because its not like going to a department store. It’s so much more fun and exhilarating. Do you have favorite thrift shops in the city? Yes, all of the Housing Works stores. We love Housing Works. Stan, my partner, likes to thrift, too, and he says there should be at least one thrift store open 24/7, because for those of us who love to thrift, we might go through withdrawal at 11 o’clock at night. Advanced Style has grown from being a blog to being a book and now a film. How has being part of all this changed your life? I get recognized at least two or three times a day, on the subway or on the street, usually by people under 30, which is mind blowing that the film has attracted such an audience. And guys, young guys; two Brazilian guys recognized me at the Met. Besides being recognized, it’s opened so many doors to friendships — both younger people and older. I pick up young people on the street all the time and I stay in contact with them. We often have parties where we throw them all together. And doors keep opening. I just made a series of hats for the Neue Galerie uptown. So there’s more visibility. There’s also a lot more teaching — I’m teaching at MOMA, the Museum of Arts and Design. What were you up to before Advanced Style? I was making things, but getting a little tired of figuring out where I was going to store them. So I was making less and doing a little bit of teaching. And I was doing some healing work and I was a community chef. How did you meet Ari? He was working at the New Museum coffee shop, and I walked in one rainy day with a friend and went to coat check. I had pink hair then. He came up to me and said, “I have a blog of women over 60, can I take your picture?” And I was like, “How do you know I’m over 60?” So I gave him my card, and told him to come over. I said, “I’ll dress, I’ll undress and make you a vegetarian lunch,” because I’d heard he was a vegetarian. I think he was a little taken aback. I didn’t hear from him for five days, so I called him and asked him to come to lunch. And he did. I was one of the first he spent time with at home. He photographed me cooking, my art, we changed outfits. And that was the beginning. Just don’t even look at the numbers. There’s a quote by Satchel Paige, who was a baseball player, that goes, “How old would you be if you didn’t know how old you are”?” So, aging with attitude — you have to maintain your health, because if you are healthier you have all the freedom to do what you want, and life is more expansive and freer. Also, stay social and mix it up. Hang with the young people and the older people. You need to know what is going on. And they need us. And frugality is fun. What’s been the most exciting tech development you’ve seen? The Internet. Google and email – the number of friendships I have made because of the Internet would never have happened without it. The Internet is an amazing, amazing tool. It’s adventuresome. 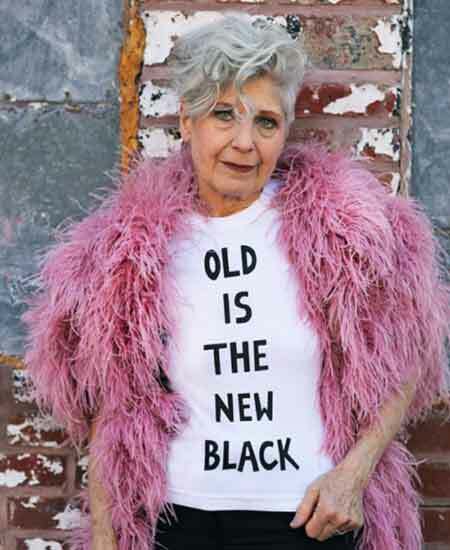 Follow Senior Planet’s board Styling With Attitude: Debra Rapoport on Pinterest. I feel DR isn’t so much an “artist” as she is a person who likes attention whether it’s good or bad. She came to the legendary Westbeth Flea Market – and bought stuff, and will come back for more. Info on Westbeth Flea Market at westbeth.org/wordpress/westbeth-flea-market and at westbeth.org. I see Debra on the street in the West Village, and her outfits are bold, innovative, stylish, and very comfortable looking. She always looks magnificent and cozy. So, so, so inspirational,am76 and not ready to give up,yet,off to make a hat and put on my culottes !!!! This is a very informative article. i enjoyed it immensely. i think her hats were great . Good job senior! Cool piece about my neighbor. We live in the same building. Debra’s outfits when she gets on the elevator. She really has style. Now I will watch the TED talk.